Harry Cornick admitted that the Luton players were ‘furious’ at the penalty decision that turned the tide in Charlton’s favour on Saturday and consigned Town to a first defeat in 29 League One games. Addicks striker Lyle Taylor went to ground under very little contact from centre back Sonny Bradley and referee Gavin Ward pointed to the spot against the protests of the Hatters. Taylor converted to level the scores and then scored again with the second of two goals in as many minutes to make it 3-1 after Igor Vetekele had put the hosts in front. 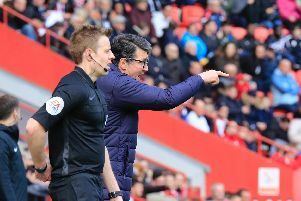 Luton boss Mick Harford called the decision a ‘disgrace’ and Cornick, who had given his side the lead in the 15th minute with his first goal on his first start since December, said: “The boys are furious at the decision and Sonny said that it’s not a foul. There had been a Charlton penalty claim moments earlier when Jack Stacey and Jonny Williams collided, to which Addicks boss Lee Bowyer said: “I thought Jonny’s one was a stonewall penalty and I though Lyle’s one was soft. After conceding the lead, Town were then guilty of losing possession too frequently and were twice in quick succession. It was the first time in 76 matches that Luton had lost after taking the lead, but Cornick insisted that the table-toppers will not change the way they play just because their record-breaking unbeaten run came to an end. “It’s obviously gutting for the team,” the forward said, adding: “We’ve had such a great run, 28 unbeaten, but we’ve come against a good team. "They’ve played well, we were sloppy at times and it was unfortunately that we didn’t get a result. “We try to play out from the back, play good football and that’s what we tried to do. “It’s obviously not going to come off every time. Sometimes you’re going to give the ball away. "Everyone makes mistakes and we were punished by a good team. “They’ve got some great players in their team and if you give the ball away in those circumstances, you’re going to be punished. We were. “We can’t change the way we play. We can’t become a long ball team.